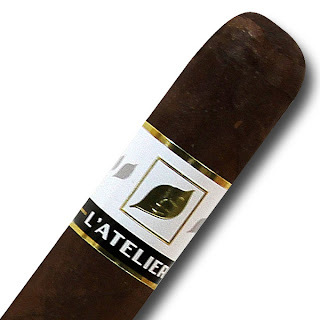 Today, we are going to look at the L’Atelier line of cigars. In fact, Corona Cigar Co. just started to carry the All New L’Atelier Maduro, available in three different sizes! Darker and richer than L’Atelier Sancti Spiritus, they are the newest creation by Pete Johnson in the famed My Father Cigars factory located in Nicaragua. Let's take a look and see what we find. I'm smoking the 6.5x56 ring gauge for this review. The cigar appears to have almost a matte finish on the wrapper. It's virtually seamless and only shows the slightest signs of veining. With the flame to the foot of the cigar, I instantaneously began to experience a flavorful bout of spices and pepper. Not overpowering, but strong. I've smoked my way in and now have a nice one inch ash on the foot. It's a nice white color with slender lines of black peeking out every so often. The draw has been superb and fragrant clouds of smoke are plentiful. The pepper has subsided at the moment and the spice tones have picked up. I've also caught a glimpse of mesquite BBQ like notes that lasted for several seconds before morphing into the background. The cigar picks up slightly at the midway point. A full medium-bodied tone has taken over; I’m getting lots of cedar, spices, and earth. The cigar is remarkably rich with flavorful Nicaraguan tobaccos. It is very smooth, yet complex and bold, letting off vast amounts of flavor and smoke. At about the three inch or so point, the ash finally fell off. On the final half of the cigar, things pick up further and the L’Atelier borders on going full-bodied. The pepper notes mentioned earlier have returned and leave a slight bite on the end of my tongue. It's a nice change. As I near the nub, loads of earthy, spice, and black pepper are front and center. 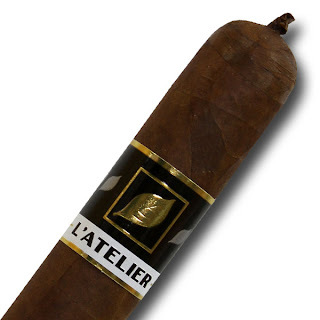 The L’Atelier is a fantastic medium to full-bodied smoke that will be a treat for anyone who enjoys a stronger cigar. Rich, complex, and smooth from start to finish, the L’Atelier Sancti Spiritus will get many recommendations from me. L’Atelier Maduro - New in Stock! A dark rich Connecticut broadleaf wrapper encases a hardy blend of Nicaraguan fillers. The cigar has a finely aged aroma of earth and wood. The wrapper is dark chocolate in color and has the appearance of being a very strong and flavor driven cigar. Made in the traditional Cuban fashion, the L’Atelier Maduro has a triple cap and is firm to the touch. After lighting the foot of the cigar, I'm greeted with a strong earthy tone. A little farther in, I tasted a citrus flavor on my palette. It's light, but relevant. The earthy tones have continued on through the first several inches of the cigar. Like the L’Atelier Habano, the Maduro is very smooth to smoke. The construction is perfection times two, while the draw is light, airy, and pleasant. Smoking my way through the first half and into the second half, the cigar moves into a nice full-bodied smoke. Dark rich tobacco tones are found along with cedar, hints of cocoa, and leather. For the true cigar connoisseur who loves a good Madura cigar, the L’Atelier maduro will be right up your alley. Complex and brimming with full-bodied flavors, this would make an excellent after dinner cigar. Serve this alongside your favorite glass of port and an excellent evening will be in store for anyone lucky enough to get their hands on a few sticks.